Narcolepsy Network is sponsoring support groups throughout the country through a new program running on Meetup Pro. If you’d like your group to be included in this map, please contact me at kharper@narcolepsynetwork.org. Visit http://www.meetup.com/pro/NarcolepsyNtwrk/ to see our new map. Hello fellow narcoleptics, this is Keith from New York Narcoleptics. I’d like to talk to you about support groups — how awesome they are, why you should join them, and how you can even go about starting one. I’ll be sharing how Narcolepsy Network recommends starting a group, as well my own personal experiences and tips. Why are support groups so awesome, you ask? It can be incredibly relieving (and empowering) to join a community of people just like you. When you’re dealing with such a confusing condition as narcolepsy, it can be a life­changing experience to meet others who feel your pain. You’ll undoubtedly learn a lot, and then you’ll be able to share your knowledge with others. 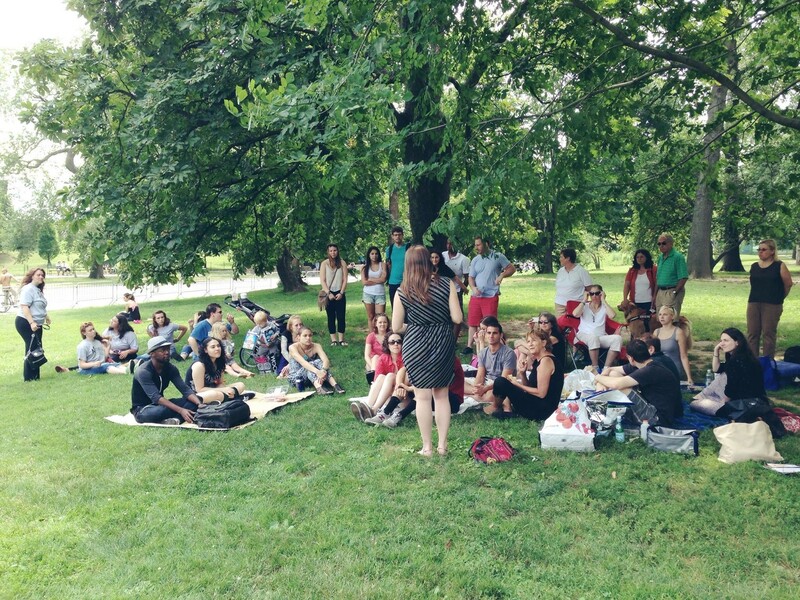 Julie Flygare speaking at our annual summer picnic (2014). First, pick a name! Try to keep it simple. For instance, a couple current group names are “Central Virginia Support Group” and the “Narcolepsy Support Group of Minnesota.” I named my group New York Narcoleptics (NYZ for short, yuck yuck!) Pro tip: put the word “Narcolepsy” in the name. Next, set up an email address (separate from your personal account). By doing this, all inquiries about the support group can go to one central place. If the time comes when you need to pass duties over to another person, you don’t need to worry about lost information. If the email system has tools, take advantage! For instance, in Gmail you can share upcoming meeting dates with members’ calendars, and save important information using Google Docs. In New York, we run our group through Meetup. We take advantage of Meetup’s many tools: a calendar of events, member profiles (they can be private if you wish), pages that members can post information to, the ability for members to message each other securely, and more. A great reason to use Meetup is that many, many people are already using it, and it is a major hub online for support groups. Decide how often you’ll meet. I recommend keeping a predictable, steady schedule. For example, we meet once a month in New York. At the start of the year I plan out our calendar with my co­organizers Carla Seet and John Ibarra (thank you so much guys! Having co­organizers is fantastic, by the way). It’s good for members ­ especially potential members ­ to see that there is a schedule of upcoming events. If you are in a smaller community, your group may feel more comfortable in a private setting like a library, church, hospital, etc. In my opinion, one of the best places to start is a coffee shop! Remember when finding your spot to look for a place that is easily accessible, since driving isn’t always an option. Besides doctor’s offices or the medical community, reach out to local colleges and high schools. Print out some flyers and post in libraries or your local coffee shop. Send a press release to your local paper to help spread the word about your new group. The goal for your group is that eventually, you won’t be the only person running the group. Finding other PWN (People With Narcolepsy) is probably the toughest part about starting and growing a support group. We are a tough crowd to find! Remember that only 1 out of 2,000 people has narcolepsy, and out of them, only 25% are diagnosed. You can use Facebook, Twitter, etc. to promote your group. If a person connects online and can relate to the online group, they are more likely to go to an in­person meeting. Use math to set reasonable goals! Start by estimating how many PWN there are in your area. In the greater New York area there are about 20 million people, so statistically speaking there must be about 10,000 PWN. Based on a 25% diagnosis rate there are approximately 4,000 diagnosed narcoleptics. Now, these numbers may not be as high depending on where you live. The point is, be realistic about how many PWN you can serve, and set appropriate goals for your group’s growth. NYZ has been fortunate to have grown to over 160 people in three years, with an average growth rate of five new members per month. This will definitely happen in the beginning, but do NOT give up. You’ll need to keep your group going for at least six months before you can gauge how successful you are at attracting new members. PWN need time to find you, but I guarantee they are out there looking for a community. It’s your job to stick it out and show up every time, even if it’s just to meet with one or two people. When I started our group, I had absolutely no idea if anyone would show up. Keep your chin up and be consistent! Open the discussion up for personal stories, but also look into inviting guest speakers like sleep doctors, or someone who can offer advice about insurance or organizational know­how. Make discussions fit the preference of your group. How can Narcolepsy Network help with the setup process? Once you decided to form your group, chose your name, and email, Narcolepsy Network can send an email out to those in your area letting them know that the group has been created. Narcolepsy Network can also send out emails to sleep centers, doctor’s offices, or any other place that you can think of that will help attract people to your support group. When your social media account is setup for the group, Narcolepsy Network will post something on its website and share on social media. Narcolepsy Network wants you to reach to as many people as possible! Narcolepsy Network also has a grant to help support groups. If you need help to get your support group up and running, let Narcolepsy Network know! Finally, I’d like to take this moment to announce a new Narcolepsy Network pilot program, running on Meetup Pro. We will be sponsoring support groups throughout the country, adding them to a central website, and publishing a calendar of nationwide events from each group. If you’d like YOUR support group to be included in this map, please contact me at kharper@narcolepsynetwork.org to learn more. Thank you ­– go forth and build community! Parts of this post were also published in the 2016 quarterly Narcolepsy Network newsletter.